CONVECTION: heat is distributed in a fluid by convection. As the fluid near the heat source warms up it expands, gets less dense, and rises. The rising fluid is replaced by cooler fluid, which in turn warms and rises. As the rising warm fluid moves away from the heat source it cools down, becomes denser, and descends. Eventually, a convection current is set up. Convection currents are important in weather. In this animation, the heat source is represented by a small flame at lower right. The gas is contained in a transparent box. Notice how there is random movement of the particles as well a a circular bulk flow current, all helping heat transfer. 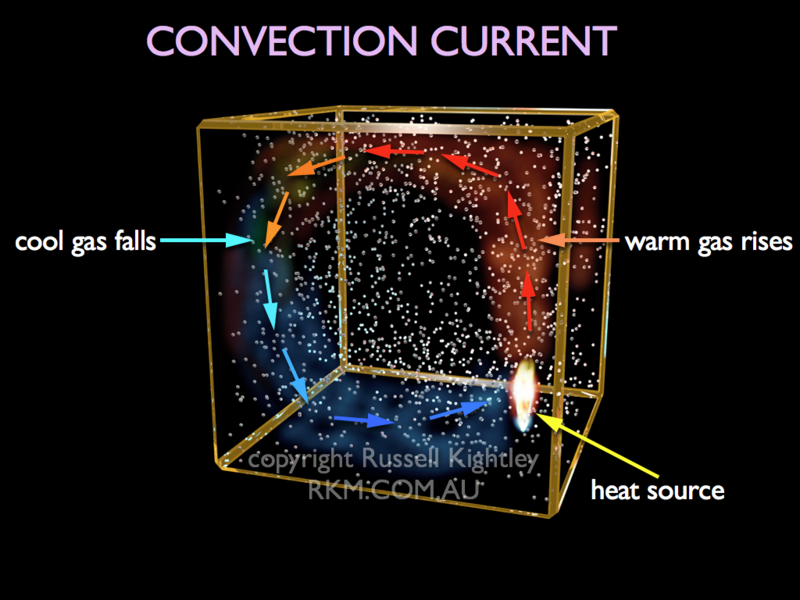 See our animation of convection heating in a room.